The Village of West Alexandria received a grant from Ohio Bureau of Workers’ Compensation (BWC) in the amount of $40,000 to purchase two cot load systems. WEST ALEXANDRIA — The Village of West Alexandria received a grant from Ohio Bureau of Workers’ Compensation (BWC) in the amount of $40,000 to purchase two cot load systems. 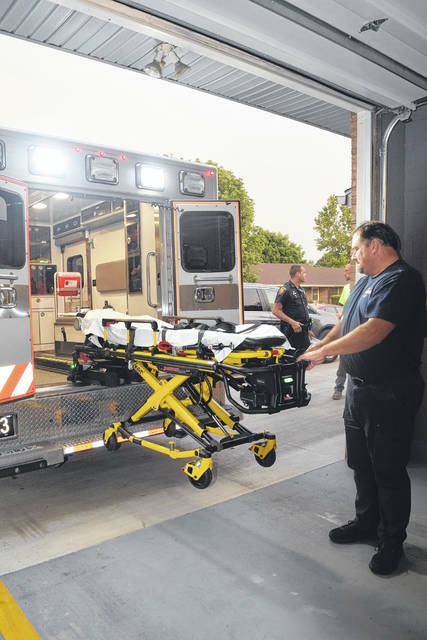 With an agreement between the village, Lanier Township and Twin Township, the cots were installed and will reduce injuries in the department and further add to the safety and comfort of patients in transport. “We applied for a grant through the Bureau of Workers’ Compensation last year. We were awarded it at the end of the year. We received the money at the start of this year, which was $40,000. In preparation of all of that, what we were trying to get was the load systems, which prevent back injuries and are safer for patient and the crews. If they have a larger patient, they can load the patient up without the crew receiving injury,” Chief Tom Smith said. The system is battery-powered and allows for zero lifting for the crews. With the simple press of a few buttons, anyone can remove a patient from the ambulance with no strain. This will reduce the possibility of back injuries, reduce the risk of patient dropping, and allow for easier transportation. https://www.registerherald.com/wp-content/uploads/sites/41/2018/08/web1_Cot1.jpgThe Village of West Alexandria received a grant from Ohio Bureau of Workers’ Compensation (BWC) in the amount of $40,000 to purchase two cot load systems.